China’s growth has been built on the twin pillars of millions of new workers and heavy capital investment. Neither will be enough to maintain high growth. Is the situation indeed dire? China’s GDP growth has in fact cooled from its double-digit pace of the past three decades. All things are relative, of course. Growth was 7.8 percent in 2012 and remained in the neighborhood of 7.5 percent for 2013 when this article was published—figures more than triple the growth rate in the United States in 2012. And Chinese leaders have signaled their intent to maintain at least that level of growth. But the warning signs of further slowing can’t be ignored. The country’s unparalleled growth since 1979 has been built largely at the intersection of two powerful forces: While tens of millions of new workers have flooded in from the countryside to power China’s industrial economy, the government has made huge investments in factories, urban infrastructure and heavy machinery. However, the country now faces a pair of major bottlenecks. First, its population is rapidly aging, and the size of the labor force is likely to plateau by 2016. Second, the pace of capital investment growth is expected to slow as Beijing seeks to rebalance the economy in favor of more consumption. China doesn’t have to accept slower growth as inevitable. But to avoid this, it must get more out of what it has—greater productivity from its people and more bang from its yuan. Both are achievable if policy makers and company leaders start to make changes now. After decades of rural migration to urban centers and with it a steadily growing supply of low-cost labor, the numbers have been trending downward—rapidly. It’s not hard to see why: There is a rapidly shrinking pool that will eventually disappear. Other demographic trends are equally unfriendly to sustained rapid growth. China’s population is aging, with the 60-and-above age bracket set to rise from about 12 percent of the population in 2010 to 34 percent in 2050. And as the population ages, the ratio of those employed to the total population will steadily drop—to the point where, in the International Monetary Fund’s estimate, the country’s excess labor supply (the reserve of unemployed and underemployed workers) will have all but evaporated by 2025. And as the labor supply dwindles, wages will inevitably rise. Indeed, this is already happening. Wages in China have been rising faster than GDP. In 2011, the real monthly wage of Chinese workers reached $495—significantly higher than those of their counterparts in the Philippines, Indonesia and India. The Chinese government recognizes the dangers posed by these demographic trends. Following the Third Plenum of the Central Committee (held in November 2013), reforms were announced to the one-child policy, allowing millions more parents to have two children. This policy shift will, over the longer term, help ease China’s demographic constraints. 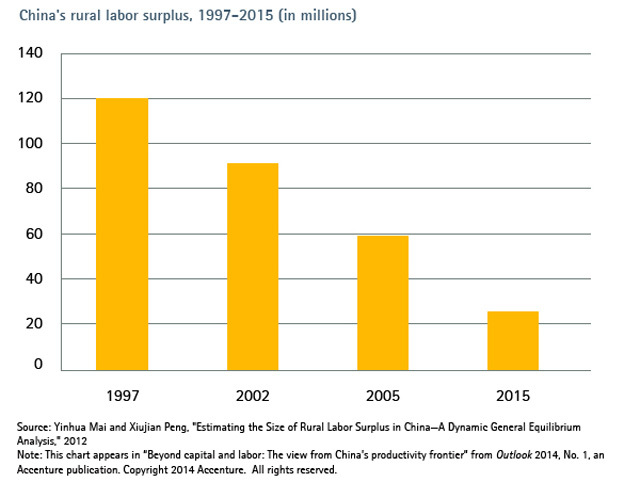 However, in the immediate term, China must focus on getting more from the existing labor force. This means improving labor mobility and reducing skills mismatches in the workforce. A first step to boosting productivity is to reform the country’s household registry system, known as hukou. It was originally established by the government to limit the influx of people from the countryside, as well as movement between cities (see sidebar). But hukou has ended up costing the country in terms of productivity by imposing barriers to labor mobility. This, in turn, prevents people from moving to places where they can match their skills to more productive jobs. Reforming the system would ease restrictions on inter-city mobility, allowing labor to flow freely to places where it can be the most productive. In fact, this is on the government’s agenda. Following the Third Plenum, the Chinese government has signaled its intention to relax hukou restrictions on settling in small and midsized cities, although they will remain in place for large cities. This is a good first step, but more will be needed. But even with easing of hukou restrictions in sight, it’s clear that China needs to make better use of the people it has. As in any nation, better education is critical to creating a more productive workforce. At first blush, China may seem to be in an enviable position. It is churning out science, technology, engineering and math talent at a rate far surpassing that of Europe and the United States. A recent Accenture study of analytics talent revealed that China will produce a surplus of key people with skills in statistical and quantitative analysis. But China suffers from its own talent mismatch. Too many Chinese graduate from universities with only theoretical knowledge, and too few have the vocational skills that appeal to employers. The consequences are illustrated by the ratio of job vacancies to applicants, which increased from 0.7 to 1.1 between 2006 and 2011. In other words, by 2011, there were more jobs available than people with the skills to fill them. "Too many Chinese graduate from universities with only theoretical knowledge, and too few have the vocational skills that appeal to employers"
This imbalance will likely worsen in the future. Prompted by a dramatic rise in college enrollment in the late 1990s, the number of junior college and college graduates in China grew by about 16 percent annually between 2003 and 2010. One consequence has been an imbalanced distribution of educational resources between colleges and vocational schools. Ph.D. students have clogged university corridors at a growth rate of 9 percent per year over the past decade. The result: Graduates between 19 and 25 who hold more than a junior college degree have the country’s highest unemployment rate, officially about 13 percent. Prejudices against certain groups, such as older employees, also persist. As Accenture research on “the silver economy” has demonstrated, business and policy leaders throughout the world need to start planning now for an aging workforce. The problem is particularly acute in China, however, where employees once were regularly laid off as they approached their 50s. These workers can still contribute if China’s educational institutions and enterprises make an effort to equip them with the skills they need to stay productive. China can also follow India by improving vocational training. Apprenticeships are a useful way to combine work with education. This was done successfully in the European Union in 2009, when as many as 9.4 million students were enrolled in apprenticeship programs. A pioneer in China in this area has been the automotive joint venture FAW-Volkswagen Automotive Co. To meet predicted labor shortfalls in the industry, FAW-VW reached out to local vocational schools in Chengdu, Foshan, Zhengzhou and other places. The company helped design a curriculum that tailors student skills to the venture’s needs. Students pursue a dual track in which they spend two years in curriculum-based class study and then complete a one-year internship in the company’s plants. Students enjoy the same benefits and pay as regular workers during the internship. Some schools send teachers to the company to direct their students’ study. At the end of this course, students receive both a diploma from the college and a professional skill certificate from the enterprise. Through the apprenticeship program, employment rates of students from the local vocational schools have risen above 95 percent. In 2012, nearly 3,000 graduates signed employment contracts with FAW-VW. But more is needed, and other corporations should follow FAW-VW’s lead. Public-sector institutions likewise can do more to train rural workers. The government can help by enacting policies that raise the profile of vocational training and attract more and better-quality students. The media should also chime in on the value of vocational training and careers. With a working population of more than 937 million, China has plenty of people to power its economy. But they must be given what they need to work productively, from legal status to training that employers value. As important as the growing labor supply has been, investment in fixed assets—roads, buildings, machinery—has been the main driver of China’s economic growth since 1979. 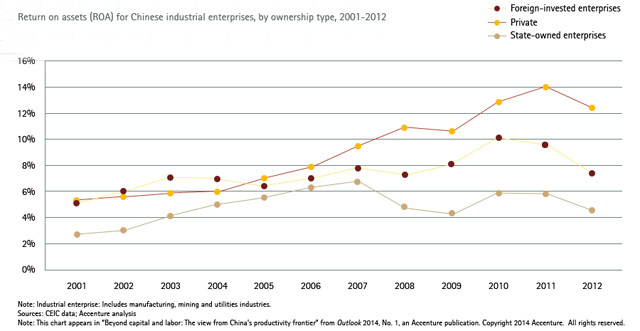 Since 2003, capital investment has accounted for about two-thirds of China’s GDP growth. Today, however, some worry that China’s growth model relies too heavily on increasingly inefficient investments. To grow sustainably, they argue, China must shift its economy toward consumption-led growth. While seemingly compelling, the conventional overinvestment story is misleading. Our research shows that capital investment will continue to be a main driver of China’s growth in the coming decade. However, the key issue facing China won’t be the volume of capital in play, but its distribution. In fact, investments in the right areas can stimulate household consumption and provide a new source of balanced growth. One sign that capital has been misallocated is the disparity in return on assets between state-owned enterprises and private industrial enterprises. On average, private companies have a higher return on assets than SOEs. Since 2008, for example, privately owned enterprises have enjoyed a return on assets of between 10 percent and 14.2 percent; for SOEs, it’s hovered between 4 percent and 6 percent. Clearly, more capital should be allocated for private-sector investment—in particular to small companies. The reason: There’s a gap in capital efficiency between China’s more than 10 million small- to medium-sized enterprises and its fewer than 10,000 large enterprises. In 2012, for example, ROA for large enterprises was 6.0 percent, while it was 7.5 percent for midsized companies and 8.4 percent for small firms. However, small enterprises are often starved of adequate funding; they accounted for just 8.5 percent of 7.1 trillion RMBs (that’s $1 trillion in 2009) in new long-term loans in 2009. In a 2011 survey of small and medium-sized enterprises, more than half of the respondents said that obtaining a loan is a “more difficult” or “very difficult” problem. Review of China’s infrastructure investments also shows that more targeted allocation is needed. Take the example of transportation. Though China has made impressive strides in high-speed rail, it still needs to invest more in upgrading essential bus services and local railway networks. China is nearly the same size as the United States, yet its total railway length is less than 30 percent the size of the US system. Similarly, China’s road density remains behind that of numerous mature economies. However, China can overcome these challenges, especially if it seizes the opportunities presented by advanced technologies. Take the example of the industrial Internet—the interconnection of machines through digital networks and data analytics. Rapid deployment of the industrial Internet in China could transform the efficiency of infrastructure in energy, transport, communications, water and urban planning. It would be tempting to look at China’s productivity growth since 1990 and conclude that the country should be envied. The rapid rate of increase in productivity is a result of the low point it started from. If you examine absolute labor productivity, China’s performance trails that of developed countries; it’s less than a quarter of that of workers in the United States, a third the rate in South Korea and three-quarters the rate in Russia (see chart). Most disturbing is the huge productivity gap between the United States and China in such critical sectors as technology, pharmaceuticals and telecommunications. While actual productivity figures (output per employee) by industry across countries are not available, we can use sales per employee as a proxy. In China, sales per employee are only 24.4 percent of those in the United States in technology, 30.6 percent of those in pharma and 31.4 percent of those in telecom. Two changes could help boost productivity in China. The first is more competition. Current regulations limit the ability of foreign and private firms to invest and fully compete in key sectors in China. If China levels the playing field, it could further increase economic efficiency, promote innovation and boost long-term growth rates. The recent economic reforms announced by the Third Plenum of the Central Committee are an important step in the right direction, as they introduce a greater role for private enterprise and markets in the functioning of China’s economy. The second is increased R&D spending. Over the past 20 years, investment in R&D has tripled in percentage terms, to nearly 2 percent in 2012. The government’s target is 2.5 percent by 2020. In absolute terms, the numbers are even more impressive. Over the last decade, the volume of R&D investment expanded 6.7 times, and China now ranks second in total R&D spending, behind the United States. However, as with capital project investment, there is a misallocation of resources. Most R&D investment centers on incrementally improving existing products and services. China’s independent innovation credentials still lag far behind the United States and other countries. To catch up, the Chinese government needs to create a favorable environment for innovation, including a competitive and open system for R&D funding and effective intellectual property protection. More important, the nation must attain a dominant position in enterprise innovation, choose its own innovative models legitimately, broaden investment and financing channels for independent innovation, and strengthen the integration of study and research. The economic reforms recently announced are an important step in this direction, as they introduce a greater role for private enterprise and markets in China’s economy. In less than four decades, China has traversed a path that took the countries of the developed world a couple of centuries to travel. Now China is entering a new stage. Business and policy leaders must shift from thinking about workers as “labor” to developing people as “talent.” They need to make capital count by investing it where it’s needed most. And they should abandon production-led approaches in favor of market-driven strategies, focusing on improving productivity through investments in innovation and technology. Can China continue to grow rapidly? With new approaches to the most important components of economic growth and a willingness to open up the economy to the benefits (and risks) of competition, it can. is a research fellow at the Accenture Institute for High Performance in Boston, where he specializes in IT strategy and management. is the chief economist of the Accenture Institute for High Performance. He is based in London. is the senior managing director of Accenture Greater China. He is based in Shanghai. is the publisher for the Accenture Institute for High Performance in Boston.